After the Pyrenean onslaught thrown at the riders over the last three days since Carcassonne, tomorrow’s rolling topography will ease the legs somewhat in comparison. 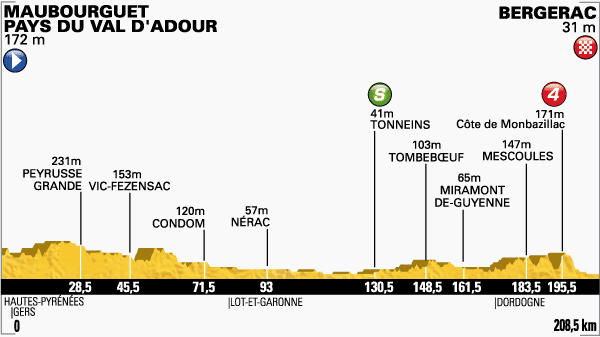 Yet it is still an almost 210km trip tomorrow from Maubourguet Pays du Val d’Adour to Bergerac, so to consider this an easy day would be foolish given the scarcity of an “easy day” during any edition of Le Tour de France. With all jerseys now settled, and the three way battle for the two remaining podium spots put on ice until the individual time trial, tomorrow offers itself up to the freshest sprinters instead. 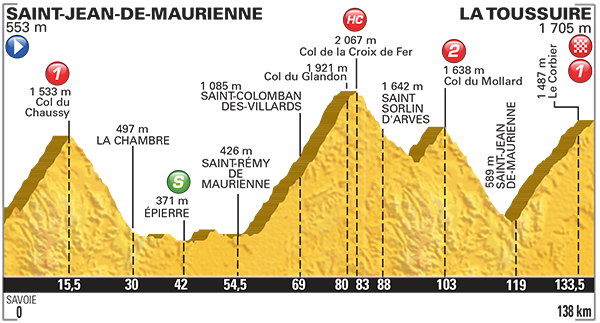 Despite the rolling nature throughout, and a Cat 4 climb with just over 10km left, stage 19 is positively flat; yet an obligatory breakaway will do their best to make life difficult for the sprint teams as it comes to chasing them down. Should such a breakaway still be away as they top Côte de Monbazilla, their hopes will remain slim as the consequential descent will lend perfectly to any chasing sprint teams. Marcel Kittel and most of the other sprint trains were last over the line on Stage 17 and certainly did not look able to overturn the tiredness in time for today. John Degenkolb could be the wiser bet for the day’s finish when looking at Giant-Shimano, especially as Kittel is likely to already have one eye firmly locked on the Champs Élysées finale. Andre Greipel is an unknown quantity in regards to his fitness since completing the last mountain run; though he was 4th on Stage 15 and could benefit again from a more disorganised sprint. Bryan Coquard and Kévin Reza had a bizarre excursion into the breakaway yesterday which seems a surprising use of their energy given the favourable terrain today. 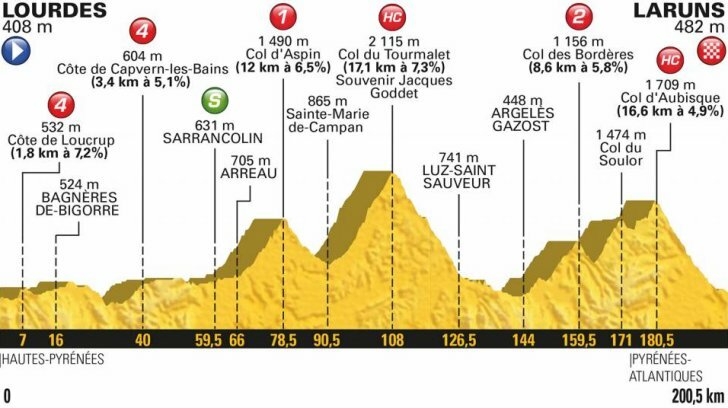 Despite being one of the most consistent sprinters this year (including intermediates) Coquard is still bereft of a stage win and stage 19 is his last chance realistically. No doubt Alexander Kristoff, Mark Renshaw, Romain Feillu and Samuel Dumoulin will be bobbing around in the top 10 in some order or another, but other than Kirstoff it is difficulty to see any of them springing a surprise upon tomorrow’s favourite. The day’s winner will come in the form of Peter Sagan. To state that he is maintained a suffocating stranglehold upon the Green Jersey competition would do Sagan a disservice, the man has been ruthless once again this year. However, he still finds himself lacking the crowning glory to this Green Jersey campaign; the elusive stage win. Sagan never fails to maintain a presence in the top 5 finishers it seems and tomorrow would appear to lend itself to him in one of two ways. First of all, the pure sprinters will definitely be more concerned with staying fresh after the Pyrenees for the Champs Élysées on Sunday, hopefully diminishing their dedication to contest today’s stage. The second way in which Sagan may find himself benefited is the Cat 4 climb; we know how aggressive he can be when he sees an opportunity to ‘get one over’ on the peloton and that could be found in attacking on the descent from Côte de Monbazillac with around 10km left, dropping like a stone in the most comically aero position he can muster. Whichever the method, Peter Sagan will be eager to add a broad grin to his guaranteed Green Jersey and will surely throw everything at tomorrow in order to be smiling on more than just the Sprinter’s podium at the end of Stage 19.